« The destabilisation of all of these (African) countries by the United States, France, the NATO countries, and Israel, is the first thing to mention. All these countries have been more or less destabilised and destroyed, going right across North Africa, down into Central Africa and of course the Middle East. » « You have an oligarchy financing the transportation of refugees into Europe, people like Soros want to create social tension by giving refugees pensions or sustenance which, of course, will create tensions in working-class districts. 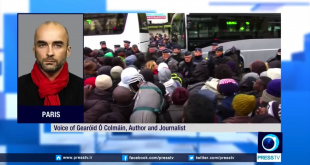 » Thanks to Press TV uploaded to YouTube on the 4th of November 2016.